Italian painter and draughtsman. 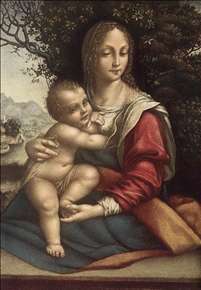 He was one of the most significant artists to emerge from Leonardo s circle in Milan, and his travels south of Rome helped to spread the ideas of the High Renaissance to painters in Naples and Sicily. As early as 1506 Cesare may have been in Rome, where he entered into a long working relationship with Baldassare Peruzzi. 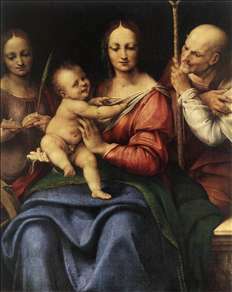 This probably began in S Onofrio, where a lunette depicting a strongly Leonardesque Virgin and Child with a Donor may be by him. By June 1508 Cesare was painting alongside Peruzzi in the Vatican Stanze of Julius II, specifically in the Pope s bedroom. 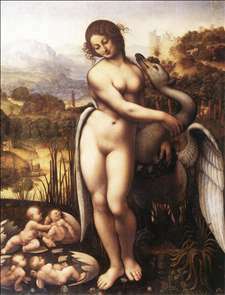 Cesare possibly contributed to the 11 frescoes (Rome, Pinacoteca Vaticana) that are thought to correspond to an uccelliera (aviary) painted by Peruzzi and described by Vasari. Peruzzi s team next worked in Ostia on the decoration of the Episcopio, the palace of Cardinal Raffaele Riario after his election as Bishop of Ostia in February 1511. Vasari described these frescoes as battle scenes all antica and attributed them in part to Cesare. Cesare s introduction to Naples may have come around this time through Cardinal Oliviero Carafa. They attributed to Cesare a votive painting of Christ and a Donor (Naples, Capodimonte), in which the kneeling donor closely resembles other known representations of the Cardinal. After six years in southern Italy, Cesare returned to Milan, where he had a workshop and received commissions until his death. 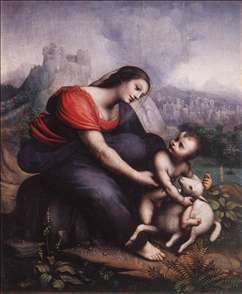 He was an important artist: he spread the new artistic ideas of the High Renaissance, transmitting elements of Raphael s style to northern Italy and aspects of Leonardo to Italy s southern regions. See more details about "Holy Family with St Catherine"
See more details about "Leda and the Swan"
See more details about "Madonna and Child with the Lamb of God"